We’re generally delighted when we see Shiro in the media, and here are just a few clips to date. 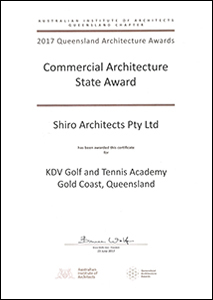 In the January-February 2018 issue of Architecture Australia, Shiro Architects received a seven-side feature review of the award-winning KDV Golf and Tennis Academy, from which are extracted beneath a few choice paragraphs from author Philip Follent’s coverage. Shiro Architects’ award from the Australian Institute of Architects is well deserved. The practice’s next project, a seventy-two-room student accommodation building for the academy on the same site, is eagerly awaited. In mid-August, 2017, Hiromi had her first Japanese-language media interview published in the Queensland edition of Nichigo Press. We challenge almost anyone who isn’t Japanese to understand it, however. On July 14, 2017, following winning her first significant award, Hiromi had her first media interview published in Australian Design Review. For both ourselves and our client, is great to receive recognition beyond the narrow confines of design commentary, so both we and KDV were delighted to receive this in the magazine Australian Leisure. We also sometimes write our own published pieces, as shown here on the web site of Facilities Management magazine, on the subject of workplace strategy. You can download a copy of the original piece printed in the December 2016 issue of the magazine here. In November 2016, the KDV Golf and Tennis Academy found its way onto the international architectural web site ArchDaily here. We were later long-shortlisted in the top 100 of ArchDaily’s worldwide 2017 building of the year sports facilities. The Urban Developer followed up with the appalling grammar of its headline in “Commonwealth Games Served It’s First Pro Sports Facility.” This was also inaccurate as the KDV Golf and Tennis Academy, despite being on the adjoining site, is simply not a Commonwealth Games building. On February 24, 2015, Shiro Architects received a welcome and unexpected accolade in The Canberra Times in this piece by its columnist Ian Warden. Featuring images Hiromi and Selina had produced at the page’s top, Ian wrote about the exhibition Engineers Australia hosted at Canberra’s Gallery of Australian Design of all entries into its 2014 Freefall Experience Design Ideas Competition. The organisation had invited engineers to design a feature installation for the Engineers Australia Freefall Pin Oak Forest at the National Arboretum in Canberra. We entered the competition with our friend, structural engineer Vesna Spasovski. Despite being among the runners up, our imagery and story had captured Ian Warden’s imagination sufficiently to supplant those provided by the winner. 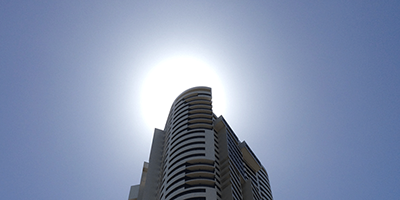 Despite his death in 2006, interest in the life and work of Harry Seidler persists, and Hiromi was interviewed for this piece about his architectural legacy and his lasting influence over the students who worked for him.